A spacious and luxurious contemporary designed villa near Choeng Mon beach, set within lush walled garden with stunning sunset and sunrise sea views. Amenities satellite TV/DVD, stereo system with iPod dock, WiFi broadband internet, air-conditioned bedrooms and TV room, fully equipped kitchen. Spacious and stylish, Summit Villa 8 is a 5-bedroom hillside home designed in contemporary tropical style, with stunning sunset and sunrise sea views. An enticing collection of beautiful artifacts augment the luxurious furnishing and chic interior design. The villa is surrounded by a lush tropical walled garden, and set within a secure gated estate. 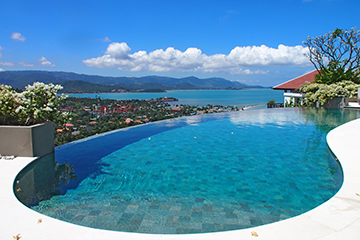 Summit Villa 8 is conveniently located in the north-eastern corner of Koh Samui, within a short drive of the island’s many attractions. A large 120 sqm free-form infinity-edge swimming pool is flanked by an expansive white sand-stone terrace furnished with loungers and parasols. The capacious living area includes shaded al-fresco lounge, open-plan living room with foldaway glass doors, and air-conditioned TV room. The living room features a sumptuous lounge, dining table seating 10, kitchen with breakfast bar and stools, and stunning sea views. Satellite LCD TV/DVD, stereo system with iPod dock, and comfortable deep sofas complete the A/V den. Complimentary WiFi internet is available throughout the villa. The villa comprises 5 en-suite bedrooms, all of which are air-conditioned. The 2 master bedrooms are very specious, both with king-size beds and wooden floors. 3 additional bedrooms include 2 twins and a double. Summit Villa 8 is a luxurious and comfortable home suitable for families or groups of friends, and is conveniently located within easy reach of the island’s best beaches, and a wide range of entertainment venues. In-villa chef service can be arranged if required, and there are numerous dining venues and bars within the vicinity, as well as a gym, water-sports, and spas. The villa is located within a secure gated compound with 24 hour security. Summit Villa 8 is located within a minute’s drive of the idyllic Choeng Mon beach, with the tourist Mecca of Chaweng, and the charming Bophut Fisherman’s Village both within 10 minutes drive. Koh Samui airport is 10 minutes drive away. -Rates are inclusive of airport transfers and continental breakfast, and exclusive of 10% service. -Minimum stay of 3 nights in standard season, except for Xmas/NY, minimum of 10 nights. -One airport transfer is included each way, with additional transfers charged at $20++ USD per trip. -Extra bed charge is $53+ USD per person. -Check-in time is 14:00 and check-out time is 11:00, although early arrival and late departure may be requested subject to availability. -Optional in-villa chef service can be arranged at a charge of 1605+ THB per meal, exclusive of provisions, which are charged at cost plus 20%. *A security deposit of $500 USD is required on arrival, to be refunded on departure, less any damages or outstanding bills. 15% discount for any booking confirmed within 20 days of arrival. Applicable to new bookings, at full occupancy rates, and cannot be used in conjunction with other promotions. Not applicable for Xmas/NY. 10% discount for booking made 150 days or more in advance. Applicable to new bookings, at full occupancy rates, and cannot be used in conjunction with other promotions. Not applicable for Xmas/NY. Fruit basket and welcome drink. Welcome pack comprising 6 small bottles of water, bread, butter, jam, milk, tea, coffee, and sugar. *Welcome Thai set lunch for full occupancy reservations in high season. *For parties of guests under the age of 21, a cash security deposit of $1500 USD is required on arrival, to be refunded on departure, less any damages or outstanding bills.